happiness, is finding the key to the right home. Watch for our next issue out June 7, 2019. May we publish your letter? Editor’s note: We love to hear from our readers. new story idea, or email us at liveit@ wctrib.com. 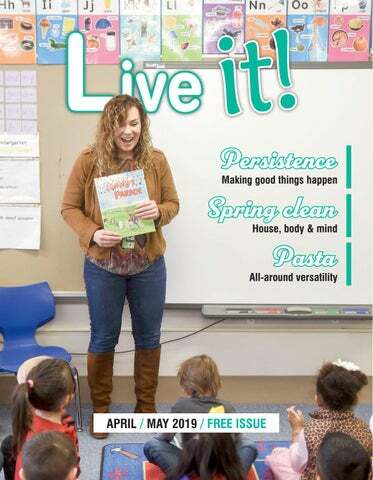 Watch for our next issue due out June 7, 2019. To advertise, call 320-235-1150 | fax 320-235-6769 or email a listed consultant. 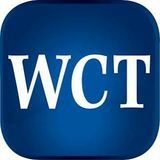 Copyright ÂŠ 2019 West Central Tribune Live it! magazine All rights reserved. Although some parts of this publication may be reproduced and reprinted, we require that prior permission be obtained. “ ... (Jared) was cool and fun and he was my best friend – and he was the kids’ best friend. He was just this good, good person.” ... Jared had encouraged Kami to spend time doing what she was passionate about – writing. and Little Falls, Minnesota, and Valley City, North Dakota. Kami has been using that same heartfelt persistence since March 14, 2017, when her 45-year-old husband, Jared, died suddenly after a morning workout at the gym, leaving behind his wife, six children and a thriving business. The shock of Jared’s death nearly paralyzed the young family and stunned the community. In addition to being a successful entrepreneur, Jared was chairman of the Willmar School Board and active in many civic organizations. Kami was left to raise the couple’s children – and left to decide what to do with the family’s agricultural-based business called Anez Consulting. It would have been reasonable for a young widow to walk away from the responsibilities of running the business. Instead, Kami stepped in, started learning, started leading and is now president of Anez Consulting. “Every new day is an adventure,” said Kami, while sitting in a conference room at Anez Consulting, located on the MinnWest Technology Campus in northeast Willmar. “I’m still learning,” she said. “I have really good staff.” Kami and Jared started the company together and for several years it was housed in the family’s home, but because she had her own work as a pharmacist, Jared was the business leader. “I was along with him and we built the company together, but in everyone’s eyes Jared was at the helm of the ship,” she said. “This was Jared’s role.” That first meeting with staff after Jared’s death was an emotional blur. When Kami and Jared started Anez Consulting, their oldest child was 11 months old and they had no clients. “It was a leap of faith,” Kami said of their decision to start their own company. The business initially involved Jared providing agronomy services for crop farmers by taking soil samples and making recommendations for herbicides, pesticides and soil fertility. But as the business grew, they hired their first employee and moved to a real office on 19th Avenue in Willmar and added manure management, permitting and compliance services for livestock farmers. Anez Consulting moved to the MinnWest Tech Campus in 2007 and added more employees and new services involving the Conservation Stewardship Program, and the business is now adding municipal and commercial engineering for below-ground services. The business was booming and poised for additional growth when Jared died. That’s when Kami walked into Jared’s office with the goal of trying to pick up where he’d left off in order to honor their clients, staff, her kids and Jared. “This is part of our legacy, but it’s part of Jared’s legacy. This is part of our legacy, but it’s part of Jared’s legacy. And our kids had looked to this as such a point of their life foundation. Kami Anez, center, works with Gabe Okins, from left, Mike Nelson, Tom Anez and Jeff Bauman at Anez Consulting. It’s More Than a Place to Stay, It’s Your Home Meadow Creek Hospitality is an assisted living and healthcare center that’s dedicated to exceeding the needs of all our residents. Our community provides you or your loved ones with everything needed to live an enjoyable, maintenance-free lifestyle. And our kids had looked to this as such a point of their life So, she set aside time every week to do nothing but write foundation. And they were just so proud of him,” she said. stories. After Jared died, she started writing a blog to help her work “There were some solid values that can be taught to kids owning and running a business, and Jared had gone through through the emotions of living without him. “I have plenty of moments when I wallow in self-pity, that with the kids.” It has taken time for her to build confidence in her busi- but at the end of the day I have kids that need me, I have a ness abilities – and time for the staff to “trust that I’m here business that needs me, I have myself that needs me,” she said. “You have to live life. You have to live.” for the long haul,” she said. It was through that blog that Lakeside Press became aware Bound by the core values and mission of running the of Kami’s children’s stories and asked to review them before business with integrity, honesty and authenticity that she selecting “Tommy’s Parade” for publication. and Jared used as building blocks Jared’s encouragement, and her for the company, Kami has found dogged persistence, has resulted support through a national peer Kami’s book, “Tommy’s Parade” in her first book being published. mentoring group made up of other – which is illustrated by The business is growing, her chilagricultural business leaders. dren – ages 10 to 23 – are doing She’s “hopefully optimistic” Glenwood artist Faythe Mills – well and Kami is now a Chamber that the business will be carried is available for sale at several Ambassador, religion teacher and to the next generation by her chillocal businesses, including Mr. B’s 4-H leader and is involved in other dren. community organizations. Chocolates, the Kandiyohi County “It seems like a lot, but it all just Persistence kind of falls into place,” she said. Historical Society and Anez The last two years since Jared’s “I have a lot of support helping death have taken Kami down a Consulting, as well as her website me.” road she never wanted to travel. Kami said she starts each day by www.whimzicalwordz.com. She misses her husband terribly watching the sunrise. and grieves that her kids don’t “I try to sit there and just see have a father. something so amazingly beautiful that it can’t help but to “Jared was not only my husband, I really liked him,” said Kami, with a raw earnestness that gives a picture to their just warm you on the inside,” she said. relationship, which started when they were both on the cheer team while attending college at North Dakota State University. “I mean, he was cool and fun and he was my best friend – and he was the kids’ best friend. He was just this good, good person,” she said. Kami grew up on a farm near Valley City, North Dakota, and Jared grew up on a farm near Little Falls, Minnesota. They shared values that involved family, farm, community, hard work and fun. Jared had encouraged Kami to spend time doing what she was passionate about – writing. She said Jared had an amazing ability to make everyone else in the room feel important – and to have confidence in themselves. Jared told her he believed in her and her abilities to write children’s stories, and she should have confidence in herself. Kami said she still has lots of questions about why Jared is gone, but said she won’t have those answers in this lifetime. Because children – like her own – also have questions about losing someone, Kami is now working on a children’s book on that topic. In that story, baby animals ask grown-up animals about where their grandpa or aunt is and what they’re doing. In the story, the little ones are assured that, yes, the frog is hopping in heaven, the deer is running through the grass in heaven and the bird is flying in heaven. “I’m trying to process it through a kid’s mind,” she said. And all the while, Jared is on her mind. Carolyn Lange is a features writer for Live it! Magazine, and a reporter with the West Central Tribune in Willmar. Kayleen Ninefeldt, from left, Alayna Ritz and Kristen Jaeb operate Ms. Kay’s Services. e all look forward to spring, but the purging, scrubbing and airing out of all corners of our homes that’s part of “spring cleaning” may not be a favorite part of the season. Love it – or hate it – spring cleaning can be a good opportunity to get rid of clutter, and the dust bunnies, before the busyness of summer begins. asked two local experts – Kayleen Ninefeldt and Kristen Jaeb from Ms. Kay’s Services LLC – to provide advice about spring cleaning. Kayleen is owner of the New London business and Kristen is the manager and cleaner. The two have been friends for 17 years and have years of experience cleaning. The idea of “spring cleaning” can be overwhelming. What’s the best game plan to have so a homeowner doesn’t give up, or worse, not start at all? Ms. Kay’s: Start by making a checklist and going room by room, from top to bottom. Sort, organize and clear the clutter. Get the family involved and take advantage of a good conversation while cleaning and organizing at the same time. Label things so you know what the container or tubs contain so you don’t have to wonder. What are the key items on the spring cleaning checklist? Ms. Kay’s: Move furniture to vacuum or mop under and behind them. Taking couch cushions off and wash and/or vacuum inside couches. Clean ceiling fans, vent covers, light switch covers, light fixtures, under tables and table and furniture legs. Get rid of cobwebs in corners, ceilings, walls, baseboards and crown molding. We also recommend washing curtains and window blinds as they hold a lot of dust. What is the best way to clean windows and screens? Ms. Kay’s: Windows and screens can be a hard task, but worth it when they’re clean. We prefer warm water and vinegar and microfiber cloths that don’t leave behind little fibers. Remove screens and use a vacuum hose or air hose to remove dust and then wipe down with a wet rag. Don’t forget to wipe down window seals and trim. Is it necessary to wash walls? What’s the best way to do it without harming paint or wallpaper? Ms. Kay’s: Yes, it’s necessary to wash walls in your home – kitchen walls get food splatters, fingerprints and grease, and bathroom walls should be wiped down often. Using water and vinegar is safe for breathing and does not remove the paint. Always remember to start at the top and work your way down. stressful. Calling in a professional can ease some of that and they can help you go through things and decide what to do with them. We can pack the special items for you to ease some of the emotions. Once spring cleaning is done, what tips do you have for keeping a home tidy until it’s time for fall cleaning? Ms. Kay’s: Do the best to pick up right away and do a quick, run-through cleaning on a different room every day. Make some sort of schedule to get rooms done once a week or every other week. Get the whole family involved and make cleaning more fun. Turn on the tunes and dance while cleaning with the kids. Set goals and reward yourself (or family) when things get done and stay neat. When and why should someone consider hiring a cleaning service? Ms. Kay’s: We truly understand how hard it can be to work, take care of your family, yourself, and maintain your home, all while still trying to have personal time. Hiring a cleaning company offers you more free time to do what you enjoy doing and relieves stress, and it feels great to return home to a clean house. Sometimes people are unable to maintain their homes because of medical health issues, and it can be a hard step to take to have to bring somebody in the home to do the work you are used to doing yourself, but that’s what we love to do, and it can honestly be something positive. Never feel embarrassed or ashamed to need help or want help with household duties. Ms. Kay’s Services offers business and residential cleaning services, including estate cleaning, move-outs and windows. Based in New London, they travel to clients outside the Willmar area. Never feel embarrassed or ashamed to need help or want help with household duties. choose to ingest, products you use on your skin, etc. This can easily be overwhelming. But fear not. I have a few simple suggestions for you to help your body out. Also keep in mind your body has natural detox functions built in. When the body gets overloaded, these functions can be a bit sluggish. This is why it’s great to help aid our body in detoxing. I like to add things to my routine that can become a lifestyle change rather than a quick fix. → Start by adding water. When you wake up in the morning drink a glass of water. If you’re drinking pop, or lots of caffeine throughout the day – try slowly switching over to water. You CAN do this, and your body WILL thank you. → Get moving. A brisk walk, 10 squats, a cycling class, whatever you can do – moving helps your body detox. The movement will help stimulate your body to eliminate toxins by sweating them out. Start with five to 10 minutes a day of exercise and work your way up to 30 to 60 minutes three to five times a week (or more). Cakes for Every Occasion Delicious custom cakes and desserts baked and designed to order for weddings, birthdays, graduations, retirements, anniversaries, baby showers and every celebration. Quite a few years ago I was “gifted” a box of thread. I had this wicker basket handy so I threw them in, and it has been on top of the sewing machine cabinet since then. You can find cheap wicker baskets in secondhand stores in a variety of sizes. Good Health Starts with Great Water! spiring. I like my space to be unique and unusual. That seems to stimulate the creative part of my brain. So, when it comes to storage, think outside of the box. I really enjoy looking for things I can use when I’m going through antique stores, secondhand stores and at auctions. Here are a few things I’ve collected through the years. I have a fondness for old dressers and they work nicely for storage, especially for things you want to lay flat. As you can see, the smaller top drawer works perfectly for the rubber stamps. Crafting paper and fabric stores nicely also. Another good option is old wood crates. Different heights give you flexibility in how you use them. Adding smaller storage within them (in one photo a wicker basket and canning jars) helps you divide and conquer the mess. Putting one on top of a dresser and on its side gives a shelf-like effect, creating even more storage. I love these old sewing machine drawers. They hold ribbon and paints quite nicely! Plus, in some cases you can stack them if your supplies don’t go over the top of the drawer. 5 Finally, one of my prized possessions. An old Mexican sugar mold works perfect for paint brushes! So, make your space – “YOUR SPACE”! Lu follows in her mother’s footsteps of unwinding and relaxing by crafting and creating. Creativity is like a muscle – the more you use it, the stronger it becomes! By Syrena Maranell Do you love reading? An evening when you can meet and hear from three Minnesota authors may be just the thing for you. Come meet Allen Eskens, William Kent Krueger and Kao Kalia Yang. The Friends of the Willmar Public Library welcome you to the first “Wisdom & Wine” fundraising event on Thursday, June 13, at the Willmar Conference Center. Doors open at 6 p.m. and dessert is served at 6:30 p.m.
Allen Eskens is the bestselling author of “The Life We Bury” and several other novels. He has been a recipient of the Minnesota Book Award and has been a finalist for the Edgar Award, given by the Mystery Writers of America. His books have been translated into 21 languages and his novel, “The Life We Bury,” is in development for a feature film. William Kent Krueger is the author of the popular Cork O’Connor mystery series set in the north woods of Minnesota. Krueger has received numerous awards including the Minnesota Book Award. His last eight novels were all New York Times best sellers. In June, a beautiful 20th anniversary edition of “Iron Lake,” with a totally new cover, will be released by Atria Books and will include a bonus Cork O’Connor short story. “This Tender Land,” the companion novel to “Ordinary Grace,” will be released in September. Into the World” and a groundbreaking collection titled “What God is Honored Here? : Writings on Miscarriage and Infant Loss By and For Native Women and Women of Color.” Tickets for “Wisdom & Wine” are $35 and will be available online at Eventbrite.com through June 3. If online purchasing is not available to you, the librarians at the Willmar Public Library will assist you in buying tickets. blanket and book • Wisdom and Wine Basket: wine, wine glasses, treats, book and blanket • Sperry House Saturday brunch for eight with McKale’s Catering • Leather bag with signed books • MOA Package for four: Crayola Experience, Nickelodeon Universe, Moose Mountain Golf • Cash Prizes – $100, $50, $50 Syrena Maranell is the Adult Services Librarian at the Willmar Public Library. For more information on these audiobooks, swing by the Willmar Public Library. The librarians are there to help you find your new favorite author. (320) 235-2020 • www.FischerLaser.com Willmar • Litchfield • New London • Olivia • Paynesville • Benson • Redwood Falls • Montevideo Primary Care Find Ad - Live It Magazine FLEC 5483.12 7.75" x 5"
ith the change in weather comes the change in wardrobe, but cleaning out your closet can be a hassle. Every piece of clothing seems important to keep – even that one sweater your grandmother gave you three decades ago that you have “just in case.” And actually finding the motivation to do it – that’s a whole other story. But, cleaning out your closet can be refreshing, rewarding and give you some piece of mind. Here’s how to maximize your closet cleaning. Clean with the seasons Spring isn’t the only season to clean. What about summer, fall and winter too? It’s a perfect time to get rid of those capris you thought you were going to wear but never did. Once a change in weather hits, take time to look at the previous season’s clothing pieces and get rid of what you didn’t wear. Be strategic Having a plan makes cleaning your closet a lot less overwhelming. Make a list. Organize by color, function and wearability. Separate into piles of “love,” “maybe,” “donate,” and “trash.” There are so many ways to downsize – and having a path to get there helps tremendously. Ask questions Cleaning out your closet is a time to reflect on what’s important to you and your wardrobe. What do you wear all time? What have you never worn? How practical is this piece of clothing? Do I only wear this once a year? Asking questions can make the task easier once you begin to recognize what you like and don’t like. Use floor space Cleaning your closet doesn’t necessarily mean you have to get rid of things. Maybe there are better ways to use the space than you thought – just look down. The floor is perfect for housing shoes, bags and other accessories. There are plenty of shoe racks for purchase – or even crates will do. Find what fits If clothing items no longer fit you and have been in your closet for over a year, get rid of them! They are simply taking up space. Take the time Organizing and decluttering your closet is a big task and takes time. To avoid frustration or stress, designate a specific time to go through all of your things. Make a fun music playlist and get to it! Erica Dischino is the photographer for Live It! Magazine and the West Central Tribune. Few flavors say “spring” like the freshness of lemon. Although this is tasty year round, it’s especially welcome as a springtime meal, accompanied by a salad of just-picked greens and perhaps some crusty bread. pring is fickle, bringing the promise of sunshine and warmth one day and a chilly blast of frost the next. Planning what’s for dinner can be a dilemma. We’re done with the hearty dishes of winter and ready to move on to the freshness of a new season. But, what to do when spring days often seem to call for a little of both? Turn to pasta for the win. Few things can match this staple for all-around versatility, going effortlessly from light to robust and everything between, embracing a garden of flavors along the way. Here’s a trio of recipes featuring the lighter side of pasta – fresh in flavor but with a comfort-food factor that appeals to appetites no matter what the spring weather forecast brings. veryone lives their life according to personal values. Usually, they are held implicitly, meaning that we donâ&#x20AC;&#x2122;t often think about them during our daily routine. However, expressing those values establishes a guide for us in life. As investors consider goals beyond financial growth when building their portfolios, sustainable investing is gaining considerable ground and options for investors are expanding. Sustainable investing encompasses investment strategies that integrate environmental, social and governance (ESG) factors into investment analysis. The motivation behind this methodology comes from investors who seek to achieve benefits beyond financial returns, such as encouraging social or environmental best practices. Values-based investing has been around for decades. The earliest strategies implemented a socially responsible investing (SRI) perspective. The majority of approaches were exclusion-based â&#x20AC;&#x201C; where investors avoided objectionable companies or industries that conflicted with their religion, ethics or values. Over time, the curriculum has expanded, focusing more on the integration of ESG factors as investment criteria. Unfortunately, it does not lend itself to hard and fast rules or metrics. In fact, some ESG factors may be more striking than others in certain situations or for specific companies or industries. Investors may be puzzled by the growing assortment of acronyms and terminology on the subject, leading to confusion in determining what actions they can take. To give you an introduction, I will focus on two important pieces of sustainable investing: defining ESG criteria and understanding investment implementation choices. a measurable impact on solving social or environmental issues. Investors directly seek companies that are focused on addressing environmental or social issues. Large investment organizations typically pursue this approach. Investments are made with the intention to generate measurable social and environmental impact alongside a financial return. Sustainable investing is about more than feeling good. In addition to having confidence that your investments are making a positive impact, studies have shown that implementing a sustainable investing approach does not limit investment performance2. The number of investment managers that implement a sustainable mandate is expanding. The reward for investors is potentially finding an investment vehicle that aligns with their objectives. To learn more about sustainable investing, and if it’s right for your long-term financial plan, talk to your financial advisor. Sources: 1 “ESG Issues in Investing: Investors Debunk the Myths.” 2015. 2 Eccles, Robert G. and Ioannou, Ioannis and Serafeim, George, “The Impact of Corporate Sustainability on Organizational Processes and Performance.” (November 23, 2011). Management Science. Craig Popp, CFA is a financial advisor at the locally-owned, independent office of Raymond James Financial Services, Inc., member FINRA/ SIPC at 115 East Litchfield Avenue in Willmar. Popp also authors The Cognitive Bias – a blog covering the topics of personal finance, wealth management and investing. He can be contacted at 320-235-1416. Any opinions are those of Craig Popp and not necessarily those of RJFS or Raymond James. Investment advisory services offered through Raymond James Financial Services Advisors, Inc. The information contained in this report does not purport to be a complete description of the securities, markets, or developments referred to in this material. There is no assurance any of the trends mentioned will continue or forecast will occur. The information has been obtained from sources considered to be reliable, but Raymond James does not guarantee that the foregoing material is accurate or complete. Any information is not a complete summary or statement of all available data necessary for making an investment decision and does not constitute a recommendation. Investing involves risks and you may incur a profit or less regardless to strategy selected. Since 1991, Heartland Orthopedic Specialists has supported and cared for more colleges, high schools, coaches, and athletes than any other practice in the region. Our team approach, advanced techniques, and positive outcomes are just some of the reasons we’ve been recognized nationally and remain the region’s most preferred orthopedic providers. “I am pushing through and keeping the faith” because that’s the truth, and when I tell the truth, I give permission for everyone around me to do the same. Wouldn’t that be something? Take care. Claudette Larson, LICSW, RPT is owner of Willow Creek Counseling in New London and has enjoyed working with children, teens and adults for the past 16 years. OPEN HOUSE Sat. May 4 ♦ 9:30am Noon Tours ♦ Door Prizes ♦ Cookies & Coffee Ideal Cooperative Living For 55 and Better! Safe-Secure-Social Lifestyle Living 7 Spacious Floor Plans · Ownership Underground Garage Plan For Your Future Now! Check it!Out! April-May 2019 What’s Happenin’? Whitney Music Center Every Thursday Willmar, 6 p.m., Whitney Music Center, 913 Business 71 North; free music concert by different individuals and groups. Barn Theatre April 4-7, 11-14 Willmar, 7:30 p.m. weekdays and Saturdays, 2 p.m. Sundays, The Barn Theatre, 321 Fourth St. S.W. ; performance of “Nana’s Naughty Knickers,” for tickets call 320-2359500 or online at thebarntheatre.com. Little Theatre April 5-7, 12-14 New London, 7:30 p.m. weekdays and Saturday, 2 p.m. Sundays, Little Theatre; performance of “Glorious! The True Story of Florence Foster Jenkins,” a comedy about the worst singer in the world in 1941; tickets available at Giving Tree Children’s Boutique in New London and Whitney Music in Willmar and at the door, if available. Kat Perkins April 14 New London, 4 p.m., New London-Spicer High School performing arts center; the Spicer and New London Lions clubs present Kat Perkins in concert; tickets available online at newlondonspicer.com. West Central Concert Series April 18 Willmar, 7:30 p.m., WEAC; the West Central Concert Series presents “7th Avenue,” a mixed vocal quartet performing a pop program of old favorites and hip covers in a blend of a cappella, live piano or guitar, and tracked accompaniment; tickets at the door. Power of the Purse April 26 Spicer, 5:30 p.m. Little Crow Resort; Empower: Women United and United Way of West Central Minnesota fundraiser, an evening of food, drink, silent auction, wine pull, purse bingo and more; proceeds support early childhood education in our communities; tickets include purse bingo package, available online at United Way of West Central Minnesota, www.liveunitedwcm.org. ‘Neither Wolf Nor Dog’ April 27-28 New London, 7:30 p.m. Saturday, 2 p.m. Sunday, Little Theatre; “Neither Wolf Nor Dog,” film adapted from the award-winning book by Minnesota author Kent Nerburn, presented by Rialto Revisited, a collaboration between the Little Theatre and New London Roaming Cinema to show classic movies. Rated PG-13, tickets online on the theater website. Prairie Arts Chorale April 27, Montevideo, United Methodist Church, 7:30 p.m. April 28, Dawson, Crossroads Lutheran Church, 4 p.m. Prairie Arts Chorale presents “Broadway: Changing the World, One Song at a Time,” arrangements and selections from Broadway musicals; tickets at the door. Glenwood, 3 to 7 p.m., Lakeside Ballroom; winter dances open to all, music by Tuxedo Junction; no jeans or shorts, basic dance lessons at 2 p.m. included with admission. White Sidewalls May 3 Willmar, 7:30 p.m., The Barn Theatre, 321 Fourth St. S.W. ; concert by the White Sidewalls, for tickets call 320-2359500 or online at thebarntheatre.com. Prairie Arts Chorale May 3, Redwood Falls, Gloria Dei Lutheran Church, 7:30 p.m. May 4, Marshall, Marshall Middle School, 7:30 p.m. May 5. Spicer, Faith Lutheran Church, 4 p.m. Prairie Arts Chorale presents “Broadway: Changing the World, One Song at a Time,” arrangements and selections from Broadway musicals; tickets at the door. West Central Concert Series May 7 Willmar, 7:30 p.m., WEAC; the West Central Concert Series presents “Holy Rocka Rollaz” performing classic early rock ‘n’ roll and rockabilly of Elvis Presley, Buddy Holly, Chuck Berry, Johnny Cash and more; tickets at the door. Glacial Ridge Winery Every Thursday beginning May 9 Spicer, 6:30 to 8:30 p.m., Glacial Ridge Winery, state Highway 23 between Spicer and New London; free music concerts by different individuals and groups. Willmar Area Symphonic Orchestra May 11 Willmar, 7 p.m., WEAC; “Young Artist Concert” with the competition winner. ‘At Wits End’ May 11-12 Willmar, times to be determined, The Barn Theatre, 321 Fourth St. S.W. ; performance of “At Wits End,” based on Erma Bombeck’s life and stories; for tickets call 320-2359500 or online at thebarntheatre.com. Locally Owned Supporting Ou r Community! View New & Used Inventory, Get Directions, Make a Service Appointment & more!